Alien Mercenaries Episode #21 is up! Alien Mercenaries Episode #20 is up! Alien Mercenaries Episode #19 is up! Alien Mercenaries Episode #18 is up! Alien Mercenaries Episode #16 is up! The other night I was going through my buildman parts to try & see what I could make with them. I cobbled together 2 different bodies & then set to the task of creating matching heads for them. The first head was based off a drawing I'd done a little while ago, but the end result didn't match it 100%. It still came out GREAT though IMO. As for WHO he is, I don't really know just yet. Don't be surprised if you see him in Alien Mercenaries or in a mini-comic at some point though. I liked the idea of a character that could combine two smaller weapons to make one larger one,so when extra fire-power is called for, the two blasters can combine. This second head design I pulled out of no where, but as I was sculpting it, I was trying to give it a fishy look. I also was trying to match the color scheme to the body, so I went with a sort of evil, nocturnal fish guy...with 4 arms. The 4 arms just sorta came into play while I was building with the parts, they originally had big cannons on the 2nd pair, but I opted for hands as this makes him less top-heavy. Need to take a few more pics to get the Alien Mercenaries Bios all set up, but my next blog post (coming in just a few minutes) will be of 2 new characters I created. Stay tuned! Hey guys! 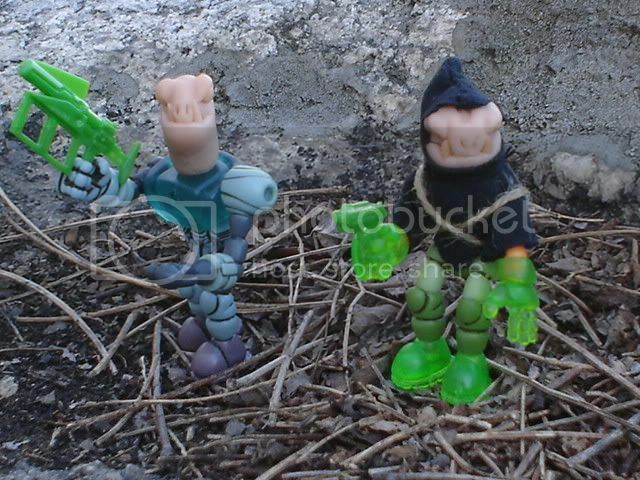 Episode #21 of Alien Mercenaries is up on the Octobertoys.com Glyos/Onell forums! With only 2 episodes left this season, things will be getting interesting. Don't miss a moment folks and coming soon here on the blog will be bios on all the Alien Mercenaries! FINALLY. It wasn't a long episode either, only 13 panels or so, but I just had a hard time finishing it (being busy with work coupled with a little writers block). Go check it out over at the Octobertoys.com forums. Hey guys! I bet the few of you who read Alien Mercenaries are wondering where Episode #19 is? Well, it'll be up soonish, HOPEFULLY by this afternoon if I can stay on top of getting it done. Last night I was just too tired to get anything completed & then after I crashed, got woken up by my stomach & that kept me up longer then I'd wanted to. BUT, I feel alright today so I'm going to finish scripting Episode #19 and get it up ASAP. NEWS! : Season 1 of Alien Mercenaries is drawing to a close, this week coming up will be the last 3 episodes of the season (20, 21 & 22). Season 2 will probably start in September, if not a little earlier (depending on how things work out with timing & what not). Inbetween that time, there will be some photo comics here on the blog that have to focus on other characters in the Alien Mercenaries universe. Expect to see the 1st one starring Monstrokk during the week of July 26th. 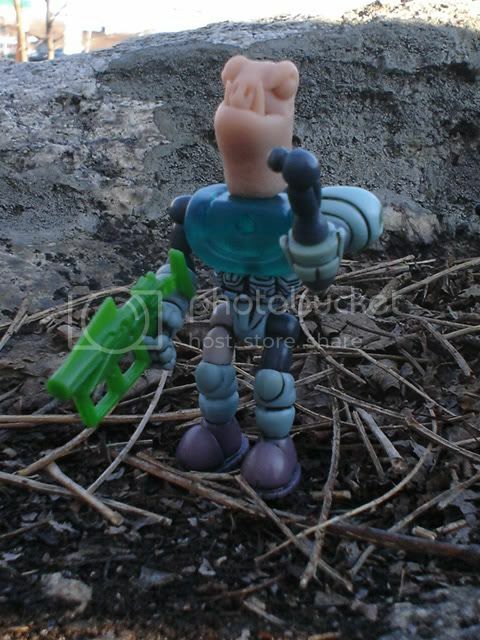 Hey guys, head on over to the Glyos/Onell forums at Octobertoys.com to see the latest installment of the Alien Mercenaries photo comic. I got called into work early today, I didn't have time to take pictures this morning, so here they are now. Basically, this is the "fur" of the creature and I'm pretty pleased with how it looks (more accessories to complete the character's look will be added to it later).I had actually started sewing the suit last night, went to sleep and finished this morning. I was really worried I'd screw up the dimensions of the suit, but it fits just fine. What this custom actually is will be revealed in an upcoming episode of Alien Mercenaries. Oooo suspense! :-D It's funny, I look at this guy & I see one of the Gnarlies from Tonka's old Rock Lords toyline. I had those toys as a kid, maybe I should give sculpting a gnarlie or two a shot? o.O? I'd been trying to build another "Armored Stranger" (real name to be revealed at some point in the Alien Mercenaries story) with my Grim Squad blue parts, but it just didn't feel "right". So I dismantled it & started work on something else. I like playing with the Glyos scale, namely combining multiple figures together to make larger creations (i.e. Monstrokk & Rott'n'dekae), and I'd had a thought: why not do a quadraped instead of a biped?? Thought I'd share these old pictures I took of the two heads that would eventually become Hurneff & Bore'okk from the Alien Mercenaries photo comic. It's funny (at least to me) to see these characters like this, when I've become so accustomed to them with their current looks. I should show you guys a picture with Bore'okk with his Ninjarran assassin's cloak off, he looks really...naked LoL. Any ways...onto the pictures! They're kinda small, but expand to a bigger window when you click on them. First picture is a close-up shot of Hurneff on what would later be used for Greh'eck's body. I didn't have a body for him when I made this head, so he just kinda stayed on this one for a little while until I had a better one ready. After this, he's been on the same body for you see him on in the photo comic. Here is Hurneff & Bore'okk hanging out. I dunno WHY I ever put that weird hood on Bore'okk's head. Everytime I look at it in these pictures, it just looks extremely goofy and silly. The body he's on in this shot was later re-configured for a different character for another project, but even that body would probably get re-configured into something else when I get more parts in the needed colors. Hurneff & Bore'okk scaleing the side of this giant rock near my job (I showed some pictures of a Buildman on it back in the Nature Shots thread on the Glyos Forums). I'd take some more shots, but that area has become SO over grown with vegetation this time of the year, it's insane. It litterally doesn't look at all like the same place anymore (actually, the picture of Sarvos with a giant moth in the Nature Shots thread was taken on that rock now, to give you an idea of how much of it has changed). New custom character picture(s) coming soon, just have to work on their bodies as they're not looking "right" to me just yet. Maybe later on tonight they'll be done, or tomarrow. Now to go shoot the rest of Alien Mercenaries Season 1 LoL. New Header Banner & Alien Mercenaries Episode #17! After season 1 is over, there will be some one-shot stories with other characters I've made to give them a chance in the spotlight. I like the idea of doing little 20-to-30 panel 1-shot photo comics as it reminds me of the old Masters of the Universe mini-comics; small enclosed story featureing one or two characters. This first one will be with Monstrokk as I re-designed him and wanted to make a photo comic to explain/showcase his new form. It came out pretty cool, and I think you guys will really dig it. 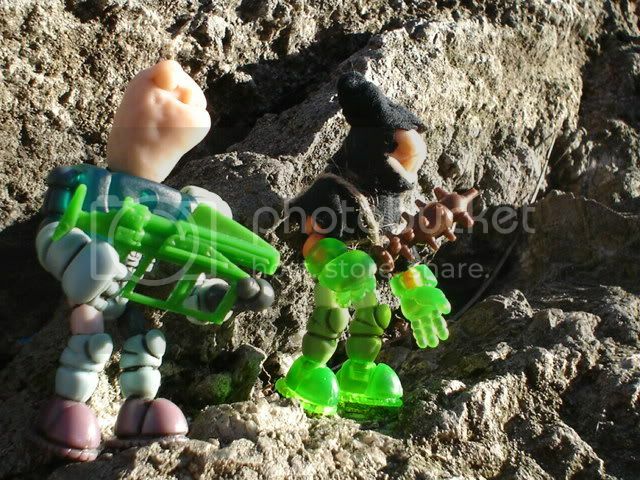 Once more, be aware to see them you'll need to register to the Octobertoys.com forums. It's still free, quick & easy to do. Seeing as I'm up with my stomach bothering me, I figured I'd post something new. Just finished working on this today, and I'm really very pleased with how it came out. I'd had a thought about doing a figure in this color-scheme but just recently got the figures for it today. So, here's my newest custom! Rott'n'dekae "Skeletal Devourer of Life"
"Rott'n'dekae exists only to extinguish life in all forms. He is walking death, and brings it to anyone he comes in contact with; forests turn to deserts, streams turn to dust and towns become vacant as he passes through them. His bite is powerful and capable of draining an victim's entire life-force in a matter of moments. He can then choose to animate them as his minions to do his bidding. The Prutarran government has put multiple bounties on his head, but even the bravest bounty hunters don't dare try to collect it. So dangerous is Rott'n'dekae, that even the destructive creature known as Monstrokk knows well enough to not cross paths with him. Multiple attempts at destroying him have proved pointless, for how can you take life away from something that is completely devoid of it?" Re-Animated Skull Headed Life-Drained Buildman! O_O!! This guy (named pronounced "Rott-En-Decay") is a homage to a number of different toylines, but most notably the Inhumanoids & Skeleton warriors. I wanted to create a character that was kinda like D.Compose, but not a 100% rip-off of him. His head sculpt is vaguely reminiscent of Dr. Herman Mangler, aka Nightcrawler from the Inhumanoids cartoon show, as that look was very creepy too. I like that he doesn't have a lower jaw, no eyes and a very life-less look to him. To construct his head, I originally was going to use a mix of sculpey, but the colors didn't come out right. I had Glow-In-the-Dark sculpey that matches the color of the body perfectly AND has the added bonus of glowing in the dark so it can scare the bejebus outta me when I want up in the middle of the night. I left his eye-sockets empty but I may paint them black at some point, so they'll show up more when his head is glowing. I added the tattered pieces of cloth to complete the shambling un-dead horror look & I think it works pretty well. I may need at least 1-2 more Grim Squad Buildmen though to balance out some parts, but for right now I think he's pretty awesome. On a side-note, posting pictures on blogspot = extremely annoying. I started this post like 40 mintutes ago & only completed it now LoL. More stuff to come, including a special 1-Shot, 30+ panel photo-comic starring Monstrokk and some poor, poor Buildmen troopers who odds are don't stand a chance (i.e. : they gonna die). Stay tuned to this blog for updates!